In genealogy, as in many other pursuits, we reap what we sow. This summarizes several lessons learned this past Saturday from professional genealogist, Sharon Batiste Gillins at the Clayton Library in Houston. The metaphors from the garden that she used in her presentation entitled Harvesting Ancestors-Lessons from the Garden provided excellent examples of genealogical lessons with a broad appeal. I highly recommend her as a keynote speaker for your upcoming genealogical events. Gardening is one of Ms. Gillins favorite past times as it gives her time to "mull and ponder" about the things that occupy her mind in her genealogical research. 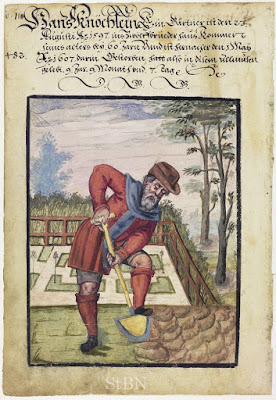 Her practices learned from the garden were compared to genealogical practices and illustrated with examples from genealogical research. The content was definitely suitable and accessible to beginners, intermediate and advanced researchers. All of us need to practice the good research habits that were demonstrated in this presentation. For example: "you can't garden without getting dirty." This garden reality leads to the realization that genealogy research is physically demanding and messy work. Ms. Gillins used an image from a county courthouse to illustrate the heavy volumes that must be lifted in dusty rooms filled with allergens. Genealogy research can be a strain on the eyes and the back. Exploring old cemeteries exposes a genealogist to the hazards of brambles, thorns, bugs and snakes. We must prepare ourselves for the difficult and challenging work of genealogy. "Know your soil: it is the foundation of the garden" leads to her recommendation that we "learn the context in which our ancestors lived." The geography, history and political organization of the localities in which we are researching, is a necessary preface to understanding the lives of our ancestors. Laws influence the shape and form of records that were formed in the past to suit certain political purposes. Understanding the historical context of those records that we use today for genealogy helps us to analyze and interpret our family history. She went further by describing sources and how they are helpful in understanding the context including almanacs, city directories, maps and land information. Garden: "The harvest comes after a long growing season." Genealogy: "Credible results must be cultivated over time." Garden: "Get in close; important details can be easily overlooked" Genealogy: "Mine every document for hidden information." And there were many more lessons. You will have to invite her to speak to your genealogical society to learn them all. I was especially gratified when Ms. Gillins used another metaphor of a 1000 piece jigsaw puzzle to explain the process of fitting the genealogical facts together into an image of our family history. "Some of the pieces look like they should fit but really don't." We need to avoid the tendency to force fit the pieces of our "Ancestor Puzzles." I first learned of Ms. Gillins talents when I read an amazing article about her discovery of some artifacts of a slave from the Moody Mansion that have been sent to the Smithsonian. I met her last year when she spoke at the Family History Conference of the Texas State Genealogical Society. I was impressed by the depth and the wide applicability of the examples in her presentations. She will be one of the featured speakers at the Institute of Genealogy and Historical Research coming up in June 2016 in Track 10 on Researching African American Genealogy: Black Roots in Unique Collections. Sign up soon as classes at the IHGR are filling up fast. This will also be the last opportunity for those of us in Texas to attend the IHGR in Alabama before it moves to Georgia. Hearing Ms. Gillins speak will help you to find a bountiful harvest of ancestors! Ms. Gillins has asked me to add a note about the origin of one of her phrases in the presentation: The phrase I used, “mull and ponder” came from Deborah Abbott and I think she learned it from Mark Lowe. I would at least like to attribute it to Deborah Abbott... She has a t-shirt that says it!